The Connected Educator's Hotspot: Building a PLC.......Again. This has been such an exciting summer for me. It started with me beginning my superintendent certification classes, a position that I have determined lies ahead for me, albeit maybe not in the near future. Then, as I pondered that future I decided it would be good for me to enhance my experiences in education by taking on a larger building and gaining additional experience with Middle School (I haven't tackled the Middle School animal since I taught 6th & 7th grade Health Ed 15 years ago). I stepped into my new role as the principal of Iowa-Grant Elementary/Middle School (IGEMS) on July 2nd and have been going at break-neck speed to keep up with the learning ever since. A new position and graduate coursework has been a daunting task, I have to admit, but it has also been a rush of knowledge, experience and networking that I have also greatly enjoyed. There is just something about new learning that can be such a "rush!" I know, you get your adrenaline fix from reading and learning? Yeah, its weird, but I really do. I know most people pick up John Grisham, Stephen King or Nora Roberts for that, but I am just giddy over Kelley Gallagher, Mike Schmoker and Rick DuFour. Save your pity, I enjoy it and that is what counts. So when I learned that my new staff did not have much background on PLC's and how they work, I was a little amazed. I had done all that homework 4 years ago. 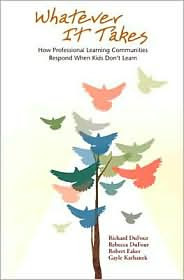 I had been working on Professional Learning Communities, and building stronger, more effective teaming skills for 4 years and was just preparing myself to move into the "Connected Educator" phase of professional development. I had learned all of these new, exciting and engaging ways to utilize technology to help expedite, energize and make professional development more efficient. At first, I was a little let down, but then I started to think about it a little more. Yes, I was committed to making my building a PLC. I still believe that the foundation of a quality school, lies in the fact that it embraces Professional Learning Community beliefs. I know, because I witnessed, how big of a difference that philosophy can make in a school's culture. I witnessed the student learning gains that were made due to the changed attitudes, practices and by the simple fact that learning now became a goal for teachers as well as for our students. I saw the difference it made when a team was not afraid to take on criticism of itself and how we operated. When we could share an idea, and beat it up, to make sure that it was a valid idea, that could take critique and still have data and research along with teacher support, then we were ready to not only say that we were a PLC, but that we were now acting like a PLC. So I have come full circle. I am back at the beginning with a new staff, a new building, new students, and a new set of reasons why we need to turn ourselves into a high functioning Professional Learning Community. There is other good news. My staff is very positive, and they have a strong sense of community already. I am sure there are some trust issues that we will have to conquer. Many teachers in the state of Wisconsin are feeling that now, after having union bargaining rights stripped away last year. Veteran staff do not have the protections they had before, and I am the new administrator in town. I am here to "clean house?" Was he brought in to "change" everything we had been building up to this point? These are valid questions in some of their heads right now, as we are only getting to know each other and what each of our beliefs are. I actually look forward to those discussions and debates. They are what made my last staff and school so strong, and what helped to make our students so successful. Heck, we even debated how successful our students were while being ranked one of the highest performing schools in our region. To start us off on the right foot, I think we will move past my original staff read, "Whatever it Takes," by DuFour, DuFour, Eaker and Karhanek. The DuFour team has come out with a newer and, I believe, better version in the book, "Raising the Bar, and Closing the Gap." This will be a great introduction to PLC's. I think you still need to follow that book with "Learning by Doing," which is a great book with practical blackline masters in it that teachers can begin to implement in team meetings. 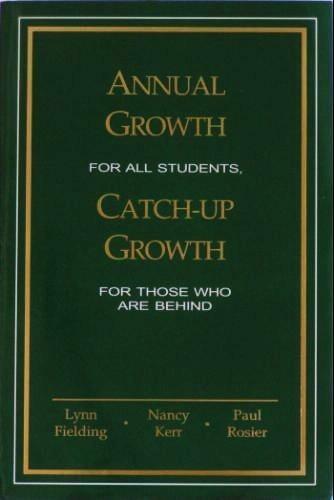 The next book I will introduce to my staff will be "Annual Growth for All Students, and Accelerated Growth for Those That Are Behind." 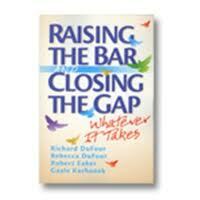 This book provided an excellent road map for improving the learning and assessment performance of students. The Kenniwick School District in Washington state, used data analysis and focused intervention on the one main factor that can make the biggest difference in student learning......Time. An excellent read, with a proven plan and the data to prove it. Finally, I think one of the most important books for any school that utilizes teams, was written by Patrick Lencionni. 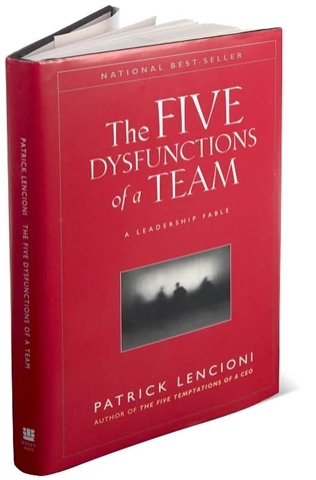 The Five Dysfunction of a Team, was one of the best books I have ever read, and my staff agreed that it made a huge difference in our effectiveness. It was so good that I also recommended it to my Administrative Team, and we took a week to go through the entire training. This is the culture I look forward to building once again. When teachers embrace the idea that, "if teacher learning improves, then student learning will improve as well," then great things can be accomplished. I am not looking to be the IGEMS Principal, I am looking forward to being the Lead Learner of an incredible school, that is focused on Continuous Improvement and Continuous Learning. And who says we can't learn a little about Twitter, Blogging and Flipped Classrooms/Staff Meetings on the journey.